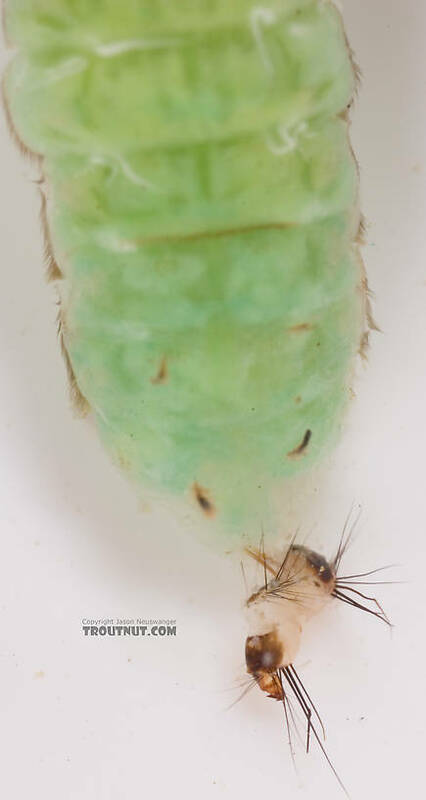 The green blob contained in this case is a pupa in the early stages of transformation from larva to the final stage we generally picture and imitate. 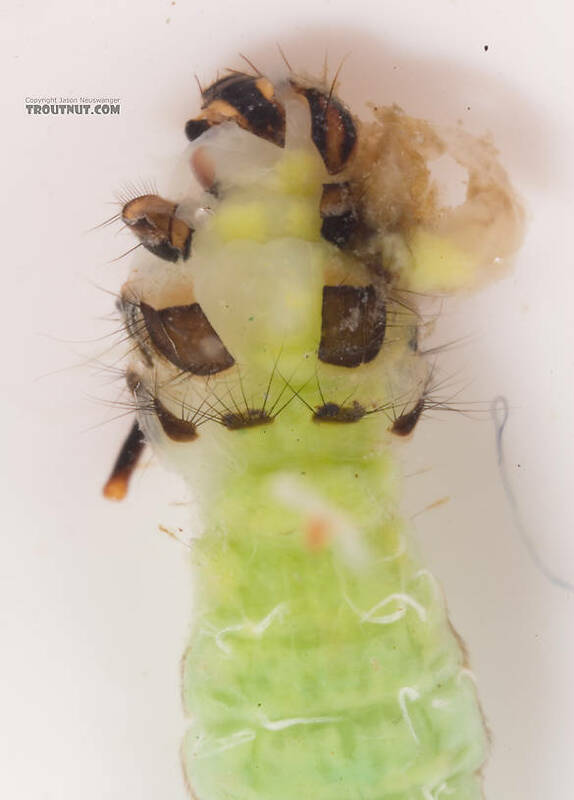 This specimen and several like it were fixed to a rock I picked up, and each one had the front of its case sealed off, protecting the helpless pupa from predation. It's neat to see the insect part-way through such a radical transformation. It was very hard to extract this thing from its case, so there's a bit of extra goo near the head from where I accidentally punctured it. This angle shows off the square cross-section of the case. It has an incredibly tidy log cabin look to it. I wasn't so sure I would get this thing out of its case intact, so I took a picture during the extraction attempt. I did end up knocking a few legs off in the process... oops. 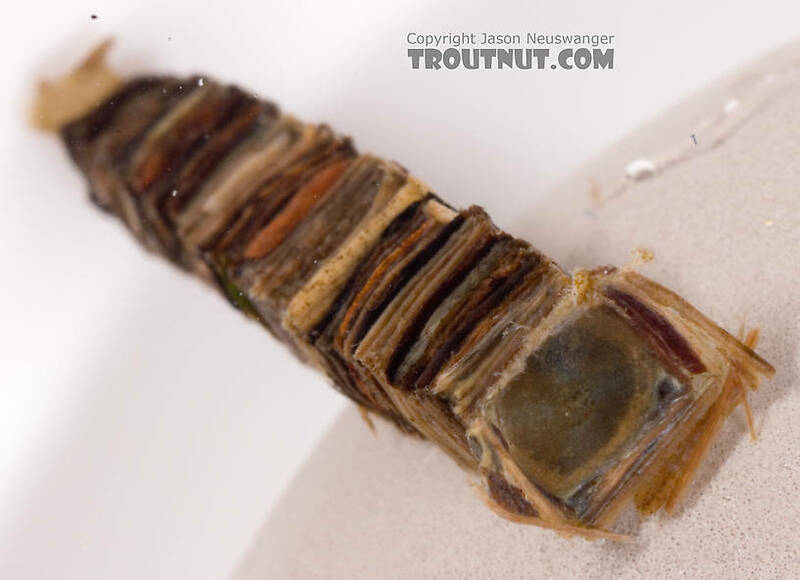 Here you can see the membrane the larva created to seal off its case for pupation. The structure on the far right in this picture helped tightly attache the case to its rock. One of the things I've done forever is carry at least a couple of fairly large (3"-4") darning needles in my vest. You can conveniently carry them inside one of your foam fly boxes or poked into a foam fly patch. Besides making a good fid (tool for opening knots) it also persuades caddis to come out of their cases generally in one piece. 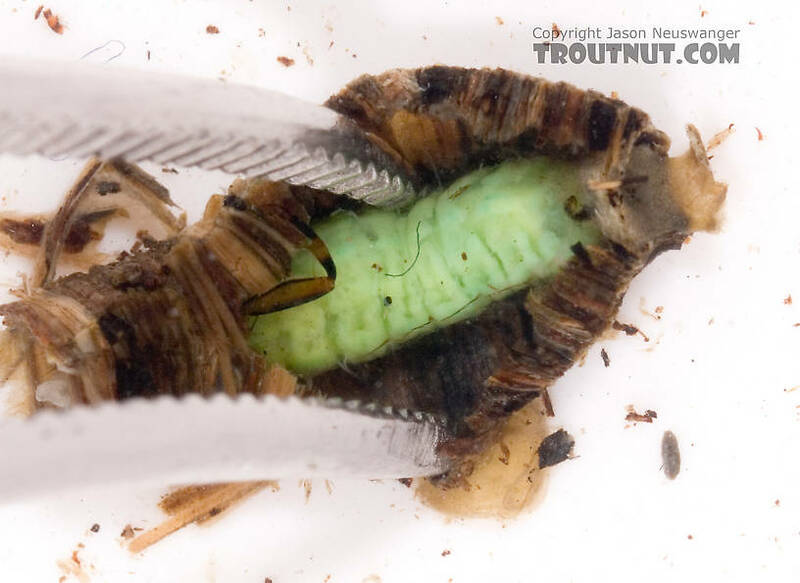 If you have the larva in your hand and he hasn't sealed the opening for pupation, you can just insert the blunt end of the needle (the part with the eye in it) in through the back of the case and slowly push. Pretty quickly, he will start coming out the front of the case and you can persuade him to come out entirely without much problem. 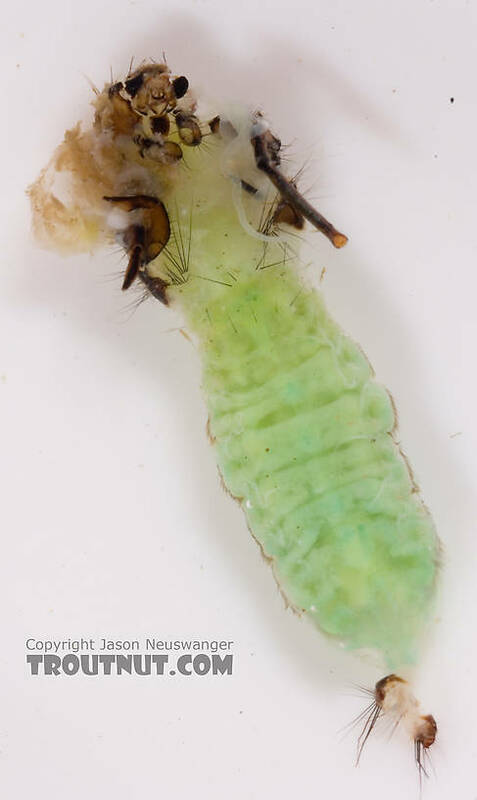 You can extract intact examples of the larva or pupa pretty easily with this method. 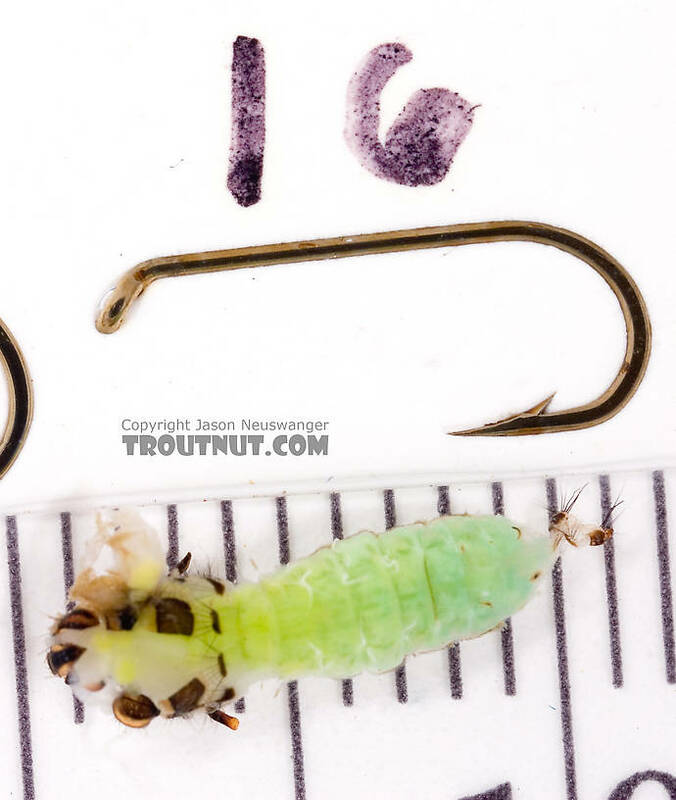 With a pupating caddis, you do need to cut off the sealed opening so the caddis can get out. You have to be pretty careful though, because it's easy to cut off his head if you aren't. Of course, you won't get those great photos of half-cut open cases, but you don't have to worry about breaking off legs either. I started carrying those needles with me when I was teaching so I could undo "wind knots" more easily, but they are great at persuading caddis to leave their case. One of our brethren recently noted some olive caddis hatching during a dark Grannom emergence on a central PA stream. Pondering this, and not knowing much about caddis, I began to wonder if the olive bodied bugs might be Grannoms as well, either in a different color phase, or one gender, such as females with egg masses coloring the abdomen some. Am I too far off? Jason, great photos. This is what I expect a Grannom and its case to look like. It's clear to me that the bugs I mention in my previous post aren't Grannoms. Their cases aren't nearly so neat, as David notes Grannoms should be, and they aren't shaped at all like the cases you posted above. 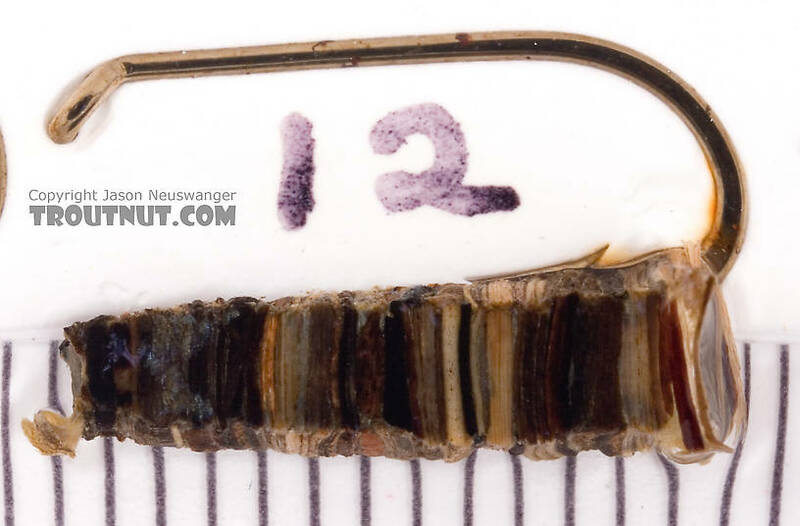 I think Roger is on to something with his photos, and Quill Gordon has given some likely suspects for PA.
do the grannom larvae in their cases hold onto the rocks with little sticky filaments which might be duplicated with a few fibers of CDC, or do they hold on with their legs sticking out which can be duplicated with hackle, or do they not hold on at all?